I have lived in Portugal for over 40 years. I am paraplegic and designed the house, so is wheelchair friendly but looks perfectly normal and enjoyable for those not in a wheelchair. Wheelchair friendly accommodation. Accessibility notice; We recognise that each person’s ability to access a particular environment will depend upon a number of additional personal factors known only to that individual, and therefore inclusion of a particular amenity or facility and the content of this website does not imply ‘access for all’, nor ‘compliance’ with the Disability Discrimination Act or other local or national legislation. What a 'welcome feeling', we felt home immediately and after a few days it was our house! It has a high standard, perfect facilities and i will definitely recommend this holiday villa to my friends with a disability. Lovely, clean villa with great customer service. Plenty of space and everything you need for a thoroughly relaxing holiday. The fabulous weather also helps! Villa with charm and comfort. Getting to this wonderful villa was an experience. While the Google map was very good, at no stage did it point out the very narrow enterance through the gap in the winding road up to the villa. Also the enterance/exit could do with a viewing mirror to get the cars in and out of the villa. The villa was clean in every respects and was well serviced and well maintained throughout our stay. The lady who did the cleaning was a joy and the two friendly dogs that minded her were an enjoyable part of this amazing place. The owner could not have been more attentive, as any small issues we may have had or indeed information we needed he was always at hand, sorry I mean on mobile. Fred also helped us source another hire car for our stay at a very good price. We would have no hesition in recommending this villa to anyone who wishes have a private well appointed place within a short car drive to all the main attractions of the Algrave. Vistors beware, the pool is very inviting but as you will find out on entering, it is "cold", not freezing but it will certainly wake you up after a night on the town. The vistors welcome pack, food, drink and water was such a great thing to have on arrival after a long day's journey. There are so many attractions and restaurants to choose from depending on taste and we can say we enjoyed most of them. I do not have all the cards with me as I write this review but some that stand out are an Indian restaurant beside Lizzy's Bar in Villamora. A honest couple with great food and a welcome just like the Irish. Dave's Bar near the Casino, lots of TV screens for sports fans and a Guinness tap, what more could you ask for. There are a number of open air markets Wednesday and Saturday, if you like that sort of thing, good value for those with a keen eye for a good deal but buyer beware, it is only a good deal if you need it!!!. The golf courses look great but I did not check them out this time as time did not allow. However, having overheard the moans of the reddened golfers in the pubs at night I am sure that anyone who wishes to four putt greens will have all their dream come true here. In conclusion, the villa, owner and staff are excellent, mind the road and enjoy your stay. Thank you so much for a great place to stay. The village had some lovely restaurants in and was very central to tour the Algarve. The villa itself was very well equipped and was very warm and cosy. It was our first holiday with a wheelchair, and it was wonderful to find that the villa meet, or exceeded, all our needs and expectations. 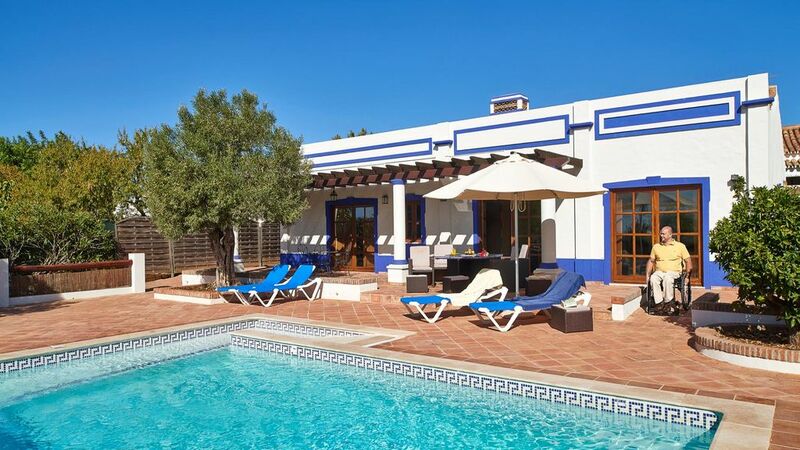 We found the villa to be exactly as described, which is essential when you have specific requirements, and very suitable for children and people with limited mobility. It was immaculate and well cared for, with a regular maid service who was very courteous and helpful. The directions to the villa were very precise, which was good as the roads to the property were very narrow, with not much opportunity to turn around! The owners provided a brief guide to local amenities, which we made use of. We would definitely recommend this property to others, and will be returning ourselves! It was difficult to get my disabled son to come away with us and I had been trying for 4 years! When he finally agreed, I was desperately hoping that his first experience on holiday since his accident, would encourage him to come with us again and be a great experience. Well - when we arrived in Faro, picked up our rental car and headed for Boliquieime we were thrilled to find that the Villa was everything we had hoped. The accommodation was suitable and large enough for my son to go everywhere in a hired electric wheelchair, and everything needed to make a disabled person happy to be away as everything had been catered for. My daughter and finance came with us plus Jamie's carer. The views were great, the swimming pool and wheelchair access was great and frankly, a week was not long enough! The villa had everything for an enjoyable holiday, the Villa was well maintained and was cleaned twice whilst we were there. The pool was also cleaned and we all swam, including Jamie with help from all of us, and it was lovely. We were able to sunbathe in the mornings, and go out to various beautiful destinations in the afternoon and then, either eat at the Villa, or go out to some lovely Restaurants close by. I have sent all the information to friends and they seems to be really interested. Yes, if the Villa is not fully booked, we will certainly go again next year. .... as the onwer it is very gratifying to recieve such a review, especially as an accessible property needs to be carefully planned and upkept and to know that people in wheelchairs are getting something out of it! The Owner. Boliquieme is a small village located 7kms from Vilamoura's beaches and 6 championship Golf courses, close also to Albufeira, 1km North of the EN125 Algarve highway, 3kms South of the IP1 motorway (A22), and 25 kms from Faro International airport.